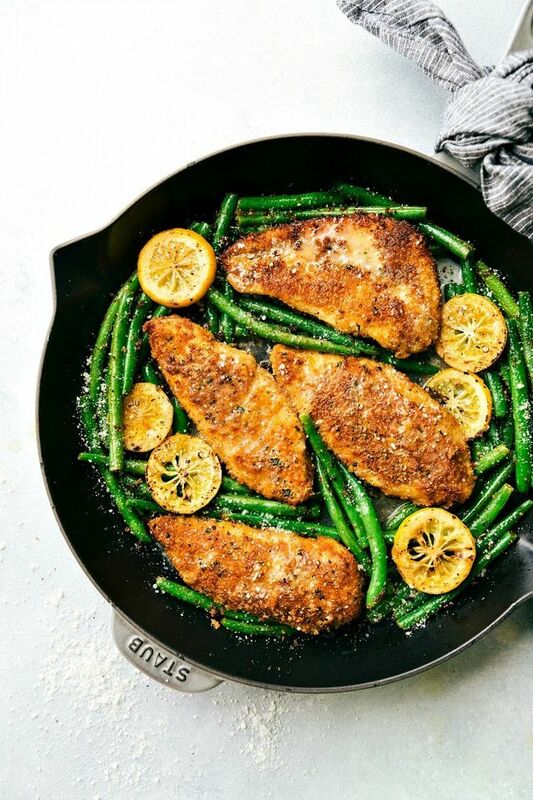 One Skillet Lemon Parmesan Chicken and Green Beans — a simple, family-friendly 30-minute meal with little clean-up required! This One Skillet Lemon Parmesan Chicken is a simple, family-friendly 30-minute meal with little clean-up required! Start with the Lemon Butter Sauce: In the large nonstick skillet, add the butter and warm it on medium-high heat. When it is melted add in the garlic and stir around until fragrant. Add in the fresh lemon juice, lemon zest, and fresh minced parsley. Simmer on medium-low heat for 3-5 minutes or until slightly reduced. Add freshly cracked pepper if desired. Transfer to a dish and set aside. Set out 3 shallow bowls or plates (paper plates/bowls for fast clean-up!). In the first, add the flour. In the second, add in 4 tablespoons melted butter. In the last, combine the paprika, Italian seasoning, dried parsley, 1 and 1/2 teaspoon minced garlic, Parmesan cheese, and Panko. Take the 2 large chicken breasts and remove any fat. Butterfly the breasts and then cut exactly in half (so you have 4 thin breasts). Then pound the halves to even thickness. Generously salt and pepper both sides of each chicken breast. Dredge the chicken in the flour, then the melted butter, and then the Parmesan mixture. If you have leftover butter and Parmesan mixture, dip the chicken in both again (you shouldn't have any leftover of either and double breading is delicious!). In the same skillet, over medium-high heat add 2 tablespoons butter. Add the breaded chicken breasts and cook for 3-5 minutes, flip and cook for another 3-5 minutes or until chicken registers 165 degrees F on a meat thermometer. If its browning too fast and not cooking in the inside, the heat is too high. Remove the cooked chicken to a plate (paper!) and tent with foil. Meanwhile, while the chicken is cooking, prepare the green beans by cleaning and trimming them. Thinly slice a lemon. Add the prepared green beans and 1 more tablespoon butter to the skillet. Season with salt and pepper and cook over medium heat until crisp tender (about 5-8 minutes). Add the lemon slices and remaining 1/2 teaspoon garlic in for the last 1-2 minutes. Add the chicken back into the skillet and serve immediately with the prepared lemon butter sauce (add the sauce to each bite (dip the chicken) as you are enjoying — don't pour the sauce over the chicken or it will become soggy). If desired garnish the chicken with 1 more tablespoon parsley. The lemons are just to infuse with more lemon flavor and not necessarily to be eaten. 0 Response to "One Skillet Lemon Parmesan Chicken"